Canada should press the United Nations to set up a tribunal in Sri Lanka to deal with suspected crimes against humanity, the NDP says. Canada should press the United Nations to set up a tribunal in Sri Lanka to deal with suspected crimes against humanity, the NDP said Wednesday. A United Nations report has already called on the organization to set up a commission to look into human rights violations committed by both the Sri Lankan military and the Tamil Tiger rebel group. "Both sides need to acknowledge and take ownership of their actions and injustices that they have brought on their people," said NDP MP Rathika Sitsabaiesan. The NDP is petitioning the government to urge the UN to set up an independent, international and impartial mechanism to ensure truth, accountability and justice in Sri Lanka, NDP MP Wayne Marston said. Thousands of people were killed in the final 2009 fight between the two sides, said Alex Neve, the head of Amnesty International in Canada. "Justice must be real," he said. "Widespread abuses, including war crimes and crimes against humanity, were almost certainly committed by both sides." Sri Lanka has set up a lessons learned commission, but it falls short of what's needed, Neve said, with the government denying any responsibility for its part in the conflict. There's been no justice for previous human rights abuses, he added. "There's never been a price to pay. And thus when the political situation deteriorates or things go off the rails in any way, why wouldn't all parties to the conflict revert to past patterns of abuse?" In 2006, Canada added the Tamil Tigers to an official list of terrorist groups, making it illegal to fundraise for them. 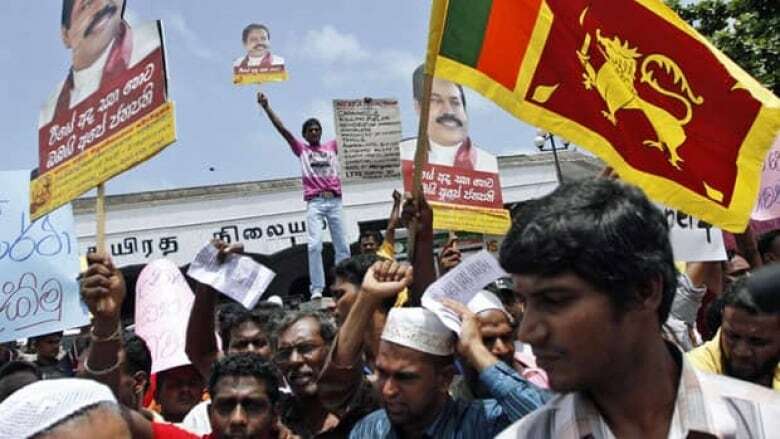 A spokesman for Foreign Affairs Minister John Baird said the government is deeply concerned about the situation in Sri Lanka, and that Canada expects the work of Sri Lanka's reconciliation commission to continue. "It's about time the NDP starts paying closer attention to this issue; we have been active on it for years," Chris Day said in an email. "We support calls for an independent investigation, as recommended by the UN Secretary General's Panel of Experts on Accountability in Sri Lanka."